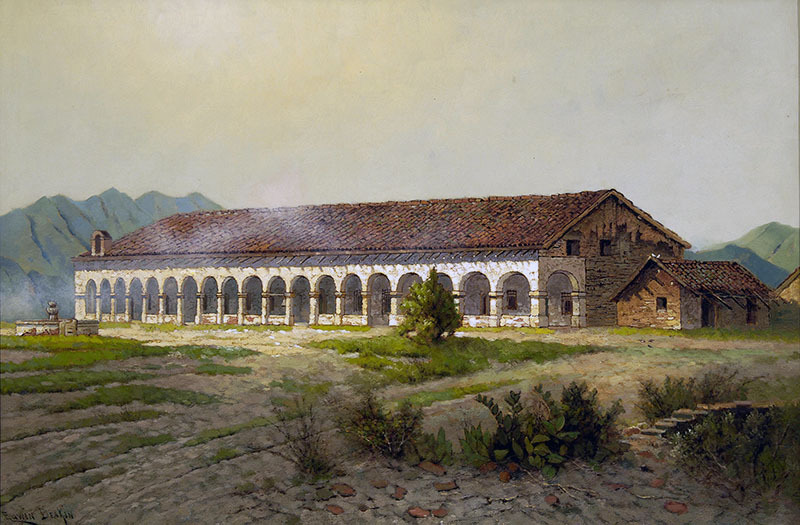 Mission San Fernando Rey de España. Courtesy of Santa Barbara Mission Archive-Library. Mission San Fernando Rey de España, founded by Father La Suen on September 8, 1797, closed the gap between San Buenaventura on the coast and San Gabriel in the interior. Situated directly on the highway leading to the fast growing community of Los Angles, Mission San Fernando became a popular stopping off place for those traveling on El Camino Real. The Convento, known simply as the long building, served as a guesthouse for visitors. Completed in 1822 after twelve years of construction a colonnade with nineteen arches borders the full length of the building. This impressive structure, often mistaken by visitors as the actual mission, has over twenty rooms, fourteen on the first floor including quarters for resident priests, a chapel, a kitchen, winery, storehouse, reception hall and guest accommodations. A rich assortment of relics and furniture of earlier days can still be found within these walls. The walls of this simple mission church are painted with Indian designs. Above the altar is a hand carved wood statue of the mission patron saint, Ferdinand III, sent by the Spanish King. The mission church served as one side of the quadrangle while the other three sides served as living quarters and other rooms. In early California, the term mission included the entire quadrangle and other surrounding buildings of the settlement. The large patio with the surrounding walls afforded protection against possible Indian attacks. In the middle of the quadrangle is an original fountain modeled after one in Cordova, Spain. From I-405 : Exit San Fernando Mission Blvd. and proceed west. 9a - 4:30p daily. Please call 818-361-0186 to confirm.